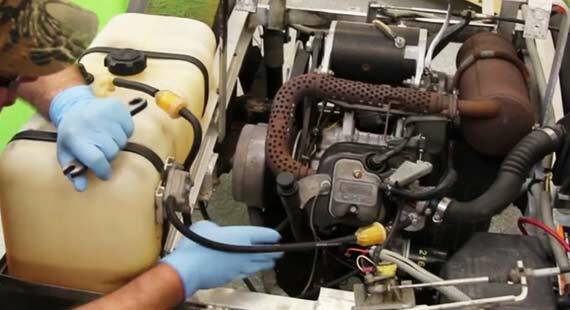 Your Club Car DS gas golf cart will need a tune up from time to time. The how to video will show you how to install a tune up kit, drive belt, starter generator belt, oil filter, air filter, and fuel filter. This will also give you the details on adjusting your valves to make your Club Car DS run smoother. My club car ds doesn’t seem to have the power like what I think a golf cart should have. I can barely make it through a small ditch without struggling , it just doesn’t seem normal to me to struggle with power like this for it being a gas powered cart. Also it’s a struggle to keep the cart in a straight line while driving down the road, having to work the steering wheel way to much. Any advice would help. Please know that I have made adjustment on the linkage underneath it seem to tighten up the over working of steering wheel but still not a steady ride. Thank you – great video. I’m a 74 yr. old widow and my golf cart quit working. This helped tremendously. Bruno: No problem, glad it worked out. Seems too easy. Is the process the same on a “99”? At “be careful’ s” when the body is on? Hi im in the middle of doing 60 tune ups on 2014 Club Car DS golf carts.. I’ve notice so many of them start much better when only depressing the gas pedal to about the half way point. Why do the start more easily with pedal in this position & is this normal? Bruno: Most of the time it is because the carbs need cleaned. It happens quite often.